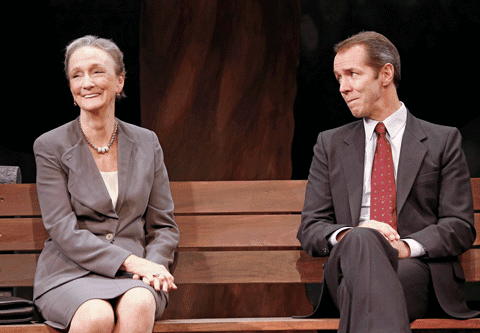 Playwright Lee Blessing offers up some harsh political truth in his powerful drama A Walk in the Woods, the show being given a very strong revival by Keen Company. It's the mid 1980s, tensions between the United States and the Soviet Union are strained, with both countries sending delegations to Geneva, Switzerland for endless rounds of arms negotiations. After one of these marathon sessions, veteran Soviet delegate Irina Botvinnik (Kathleen Chalfant) indulges in her favorite pastime; taking a stroll through a nearby wooded area away from the prying eyes of reporters. Accompanying her at her request is John Honeyman (Paul Niebanck), the new lead American diplomat recently assigned to the negotiations. Though John is rather flummoxed to learn Irina is not interested in privately talking about the latest proposals. Rather, she wants to get to know her American counterpart better and hopefully become his friend. A relationship the all business John has no desire to pursue. As these conversations play out over a period of months, it becomes evident Irina uses these walks not only as way for her to get to know John and what drives him, but also as a sort of safety valve to take the edge off the tension in the negotiations, where what's eventually agreed upon is often little more than political posturing. All of which can live or die on which side announces the deal first. John however is more determined to actually create something substantial at the bargaining table. A fact Irina accepts with a weary resignation and perhaps even a grudging admiration. As Blessing keeps pointing out, using the seasoned Irina as the vehicle for the play's message, the simple truth is that neither side really wants the negotiations to in any way alter the status quo. Especially since neither party trusts the other nor wants to significantly pare down their nuclear arsenal or be limited in terms of what they can develop in the future. As such, anything that is agreed on is mostly cosmetic and all done for show. "Don't try so hard" the President of the United State tells John at one point; showing him a political reality Irina has long since known and one which John refuses to accept, or at least let continue without a fight. Chalfant, who has the best lines in the show, does a great job as Irina, a career diplomat who has seen negotiators come and go over the years. Yet through it all she has managed to develop a quiet and cynical sense of humor and is not afraid to try to relate to others on a more personal level. Indeed, quite often the most important thing for her includes taking the time to be frivolous, as the larger issues will always be there to worry about later. It should be noted that the role of the Soviet diplomat is usually played by a man. The gender switch being done here with Blessing's approval and works quite well indeed. Niebanck has the harder role of the two as the somewhat officious, all-too-sure-of-himself John, coming off some successes elsewhere and determined to really make a difference in Geneva; eventually learning to unbend a bit and really talk to Irina. All the while wringing out a few small concessions along the way. Though his ultimate fate may be the one of many career diplomats, unless he heeds Irina's warning about what awaits him not too many years down the road. Jonathan Silverstein's direction is nice and tight, keeping the conversations between the two characters on a kind of middle ground, with the tension of the international situation ever present, but allowing the actors to play up the humor of the script with John often getting thrown for a loop by Irina's seemingly inane questions or requests. All of which actually have a purpose, even if it's just to say something funny. Scott Bradley's set of the wooded area the two diplomats constantly find themselves in is well presented, with the lighting by Josh Bradford and sound design by M.L. Dogg nicely adding to the overall atmosphere. Based on an actual incident, A Walk in the Woods offers a look at a not-so-long-ago era where things seemed simpler because the enemy was one you could better understand and envision. At the same time the play shows the importance of getting to know ones adversaries while equating the audience with some harsh political realities and a process that can grind up everyone it touches while it moves inexorably on despite any attempt to change its course.